My name is Michail Grey Wolf Guruev. Whilst my Buryat Wife with our Evenk Daughter live in the Siberian Republic of Buryatia, a member of the Russian Federation, I do roam places between Mongolia and Finland being a nomade by my nature. Because having such character I'm an artist without studio. My fields are GRAPHIC, PAINTING, TEXTILE, SCULPTURE and DESIGN. Having exclusively the theme "Natur & Man" and not vice versa as my own, all works of art are created under the open sky in presence of my animal relation. 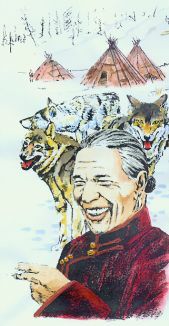 My mother derives from the Evenkis, a small Tungus nomadic nation native in regions of Siberia, Mongolia and Northern China. Father is an European unknown. 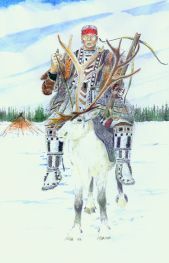 Our primary source of occupation is reindeer herding (Asiatic First Nations are the only one worldwide who rides them), hunting,fishing and horse breeding, but some of our people are busy in 'higher' leveled professions. More information about our various peoples and regions you'll find in: http://www.baikal.net, http://www.spri.cam.ac.uk/people/jeoh2/2evenki.htm and in THE BEST OF MY FAVORITE 'PAGES. For those who are interested in as well for the media's use, read what's written by others under CURRICULUM VITAE 'cause nothing is to hide. 1st) May I have your attention for a social project? Please visit the project CULTURE CENTER OF NORTHERN ASIAN FIRST PEOPLES' ART. 2nd) Most important for me is to have a manager or gallery located outside of the Russ. Federation and Mongolia who like to devote time for organizing expositions, workshops, events, projects and does sale my art. Also I would like to own the help of an agent of literature who cares for ethnic art books. 3rd) Being very creative and productive my works range from all size. From the design for a stamp up to large murals - interior & exterior. For great projects I'll be willing to travel outside of my place if they are profitable enough. A manager may cause a good order, certainly by his or her own profit. 4th) I like to offer my creative power to any kind of merchandise-productions, that like to own northern wildlife as reflection. In this case I think on: Books, calendars, posters, T-shirts, packings, souvenirs, et cetera. 5th) I previously work with architects in many regions and would be willing to work in your area as well. Such works run under 'Architecture & Art' and can show huge sculptures and wallpaintings, in- or outdoors. Some customers of my past were: 'Simson & Sears', 'Tchibo', 'Unilever', 'GermanFederal Institute of Oceanfishery', 'German-Japanese-Centre', 'Media-Center', 'State Museum of Ethnology' and 'Museum of the State Institute of Zoology' (the letter in Germany), etc., etc..
6th) I'm also fit in the designing of carpets, scarves and other textiles which need a circulat or seamless view. For each reason you can reach me under info@menschenrechte3000.de. Please note: All fees bear my financial support for the top named center! Being a self-educated artist, many clippings tell about expositions mostly held in museums of Buryatia, Russia, Finland, Germany etc. and about workshops in Mongolia, Norway, Canada or USA. Also a t.v.-report was done on me and my work, ditto local t.v.- & radio-coverages. But such were never happen in Canada or USA, two countries which gave me the possibility of global thinking.